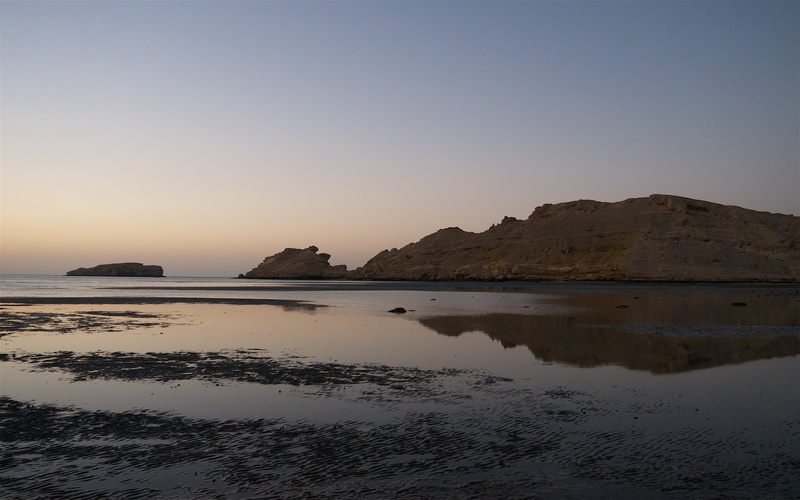 The recently widened road snakes and switches up and down the stark Al Hajar Mountains from the flat, endless gravel plains dotted with Acacia that envelop the small town of Ibri to the narrow coastal plain that runs from Muscat north to Sohar. Al Batina is populous and fertile, full of dates, citrus and other crops with a single, manic highway that runs a few kilometres inland from the coast and connects the many towns and villages. Oman is relatively poor in comparison to the UAE and there is less reliance on imported labour; so beware the ubiquitous, dented Lexus saloons that sail up to within an inch of the rear bumper and hoot until they cruise past without a sideways glance; the Omani drivers, always neatly attired under their Kuma, appear entirely unmoved by the many slowcoaches and their own creative manoeuvres to circumvent them. 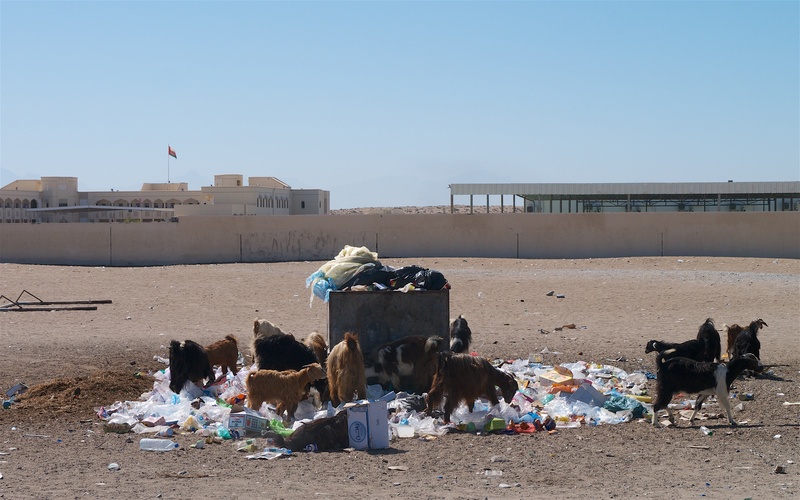 Herds of roaming goats are a familiar sight and cleanse the piles of plastic-rich, rubbish of any edible remnants. After finding the small road to the coast just as dusk nears, the beach is a bustling street of parked cars and the city folk are out to play. 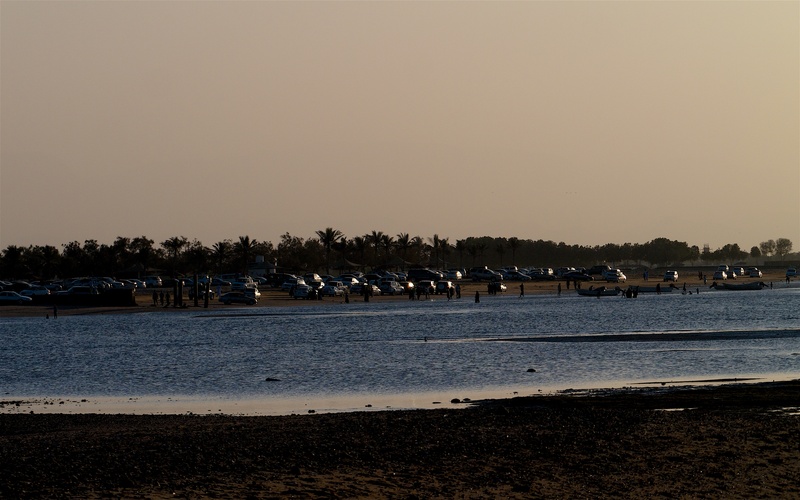 The tide is right out and children splash in the shallow pools, 4-wheel drives and others on foot venture slowly across the wet sands to the island of Ras Al Sawadi, and the place, this cool Friday evening, is a circus. 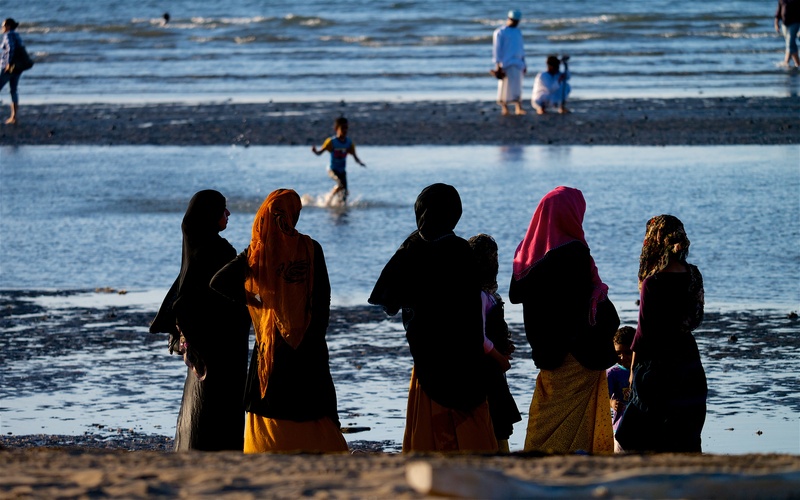 The popular beach at Ras al Sawadi. Children play and mothers look on, dressed in their Friday best. 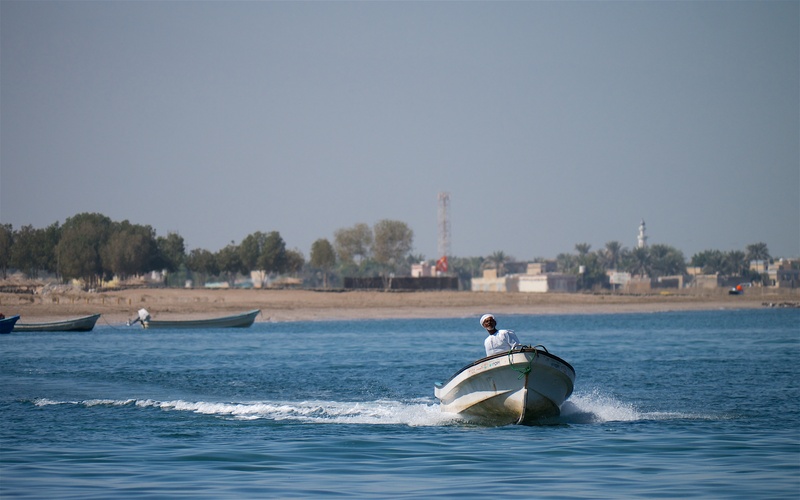 Ras Al Sawadi with another island in the small archipelago beyond. 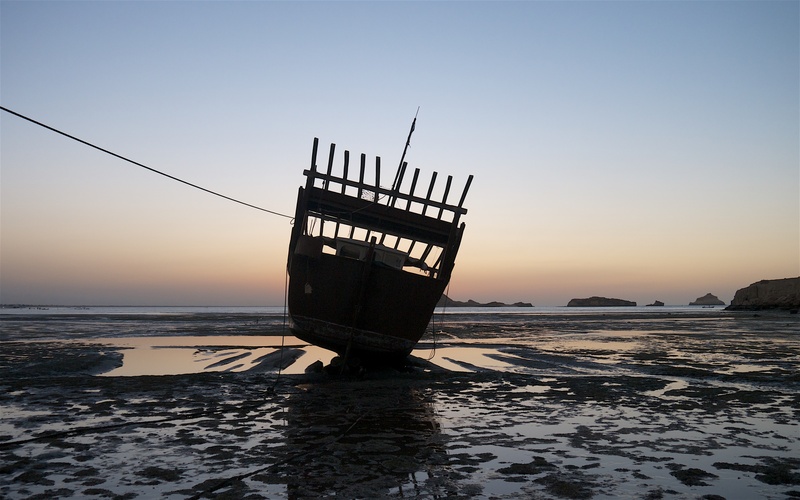 An old, abandoned fishing boat stranded at low tide on the island. Used as a perch when the tide is in by two ospreys and a kingfisher. 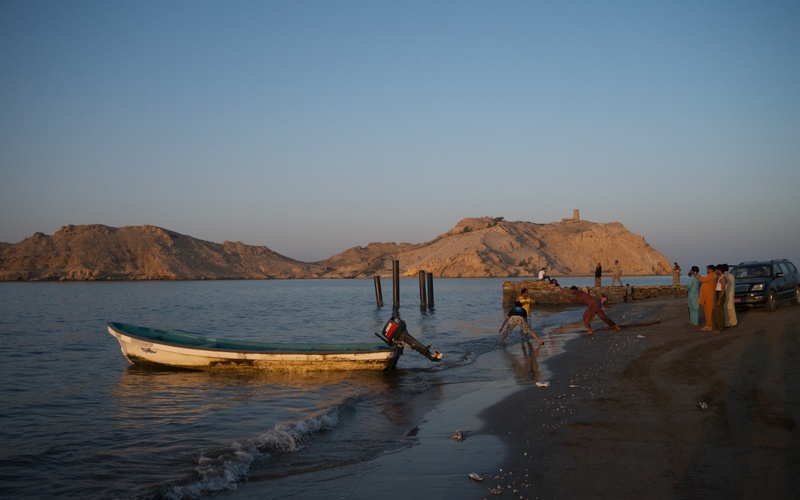 The island of Ras Al Sawadi from the mainland on another evening on a high tide. 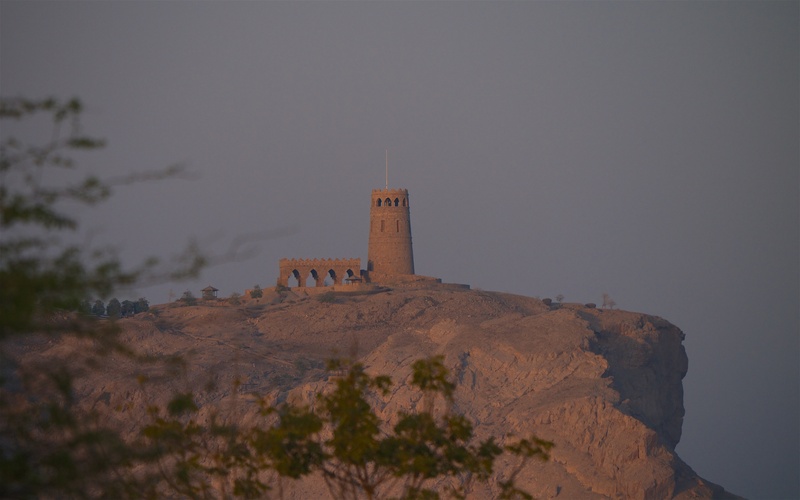 The highest part of Ras Al Sawadi has a small fortress on top of it. As dusk is falling I clamber up the cliff and watch the sooty falcons wheeling and tipping above the island. One lands and is not too concerned by my presence. These are the most fabulous and enigmatic of birds in this region. 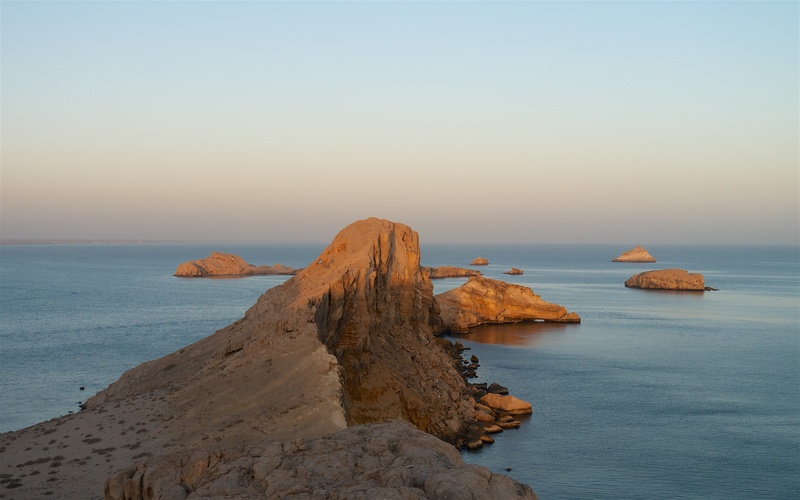 The cliffs on Ras Al Sawadi lit by the dying sun, with smaller islands and the empty ocean beyond. 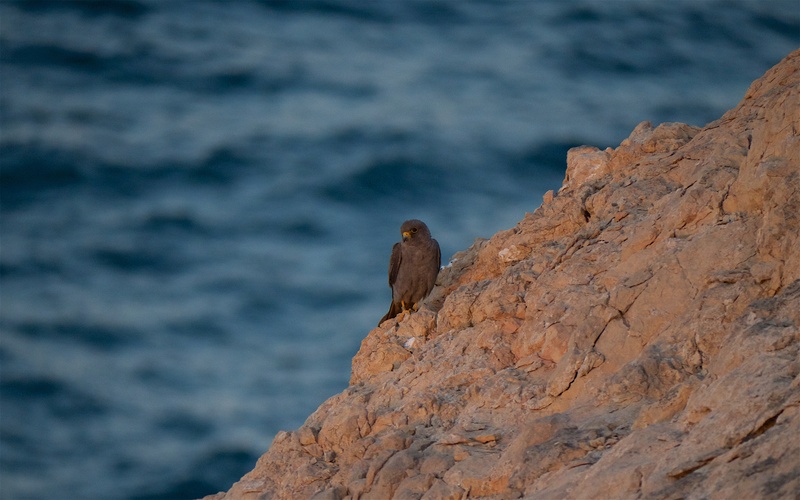 An adult sooty falcon perched on a cliff top at dusk. At dawn the next morning, after the briefest of negotiations, a fishing boat runs me across the water to the island and I have the place to myself. The island is long and narrow; there is a well-made path that rises to the small castle but I ignore this and head straight up the short slope and perch above a high cliff looking out across an empty deep blue sea. Here in a crevice somewhere below is the nest site of a pair of sooty falcons. 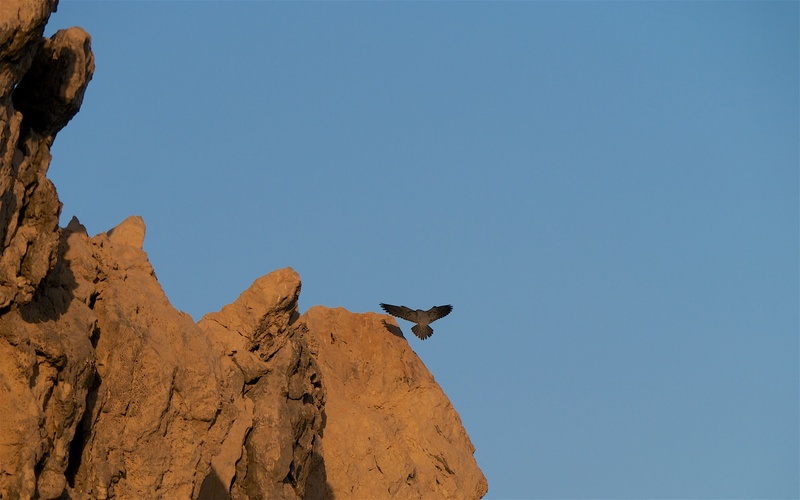 The pair has three large young that are now fledged; they and the female sit quietly on the top of the cliff and await the male. 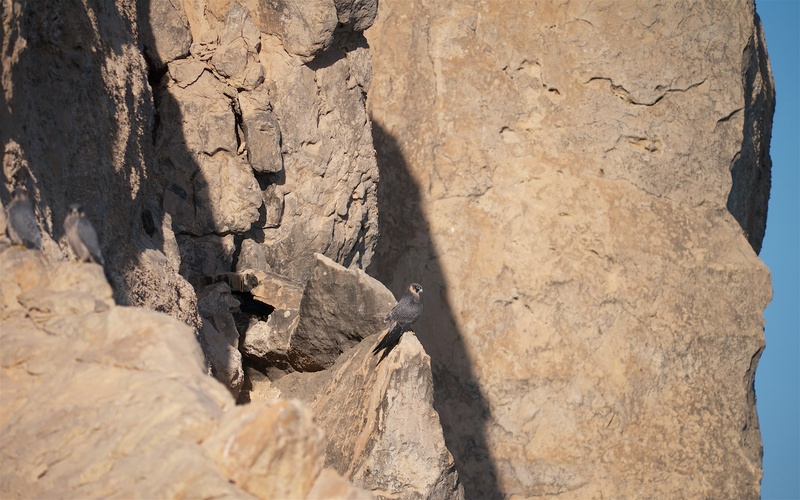 The sun warms the dry cliffs and the female, I think it is her, flies to a commanding lookout. The female waits for the male to return from a hunting trip. Sooty falcons are effortlessly elegant in their simple dark plumage; their Latin name is Falco concolor which means the uniformly-coloured falcon. 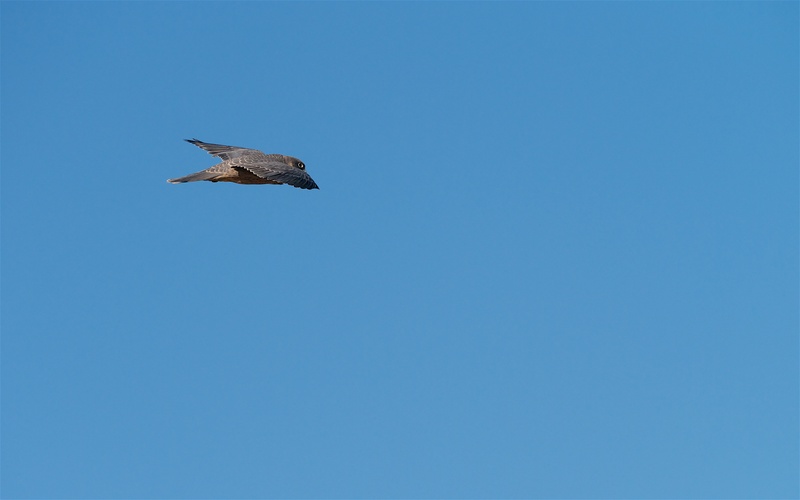 They are long-winged and sleek and do not have the muscled, hard look of the more compact peregrine. Their design gives them great agility and speed; pairs breed very late in the year to feed their young on returning migrants such as wheatears and warblers, and even red-necked phalaropes that winter in large flocks offshore. All are hunted were there is no place to hide as they fly across the open, blue seas from Asia to Africa. The male brings prey and transfers it to the female in an acrobatic food-pass. 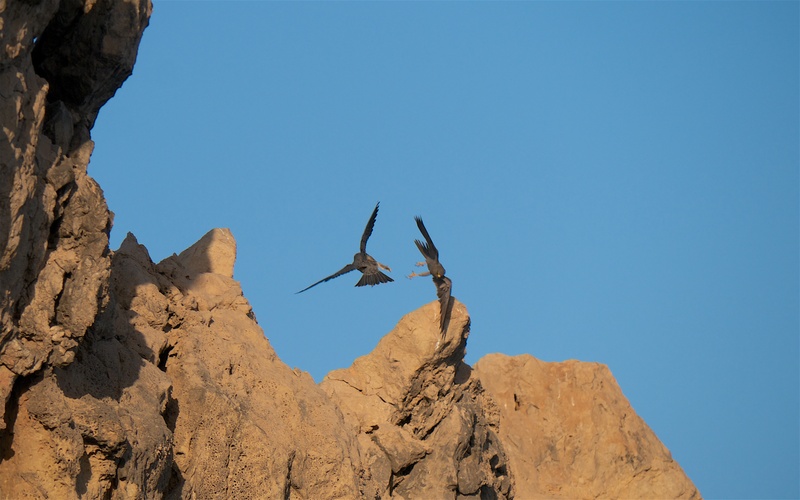 Sooty falcons breed in loose colonies and are only found on bare cliffs around the Arabian Peninsula, especially the Arabian Gulf, Gulf of Oman and the Red Sea as well as remote inland cliffs in deserts of Libya and Egypt. The world population has declined; pairs have disappaeared from islands that have been developed and/or colonised by rats and cats but no-one really knows whether there are a 1,000 or 10,000 pairs. This is because they are so hard to find and count on their isolated cliffs in the white heat of the desert summer. Three well grown young wait patiently atop the cliff. They call frenetically to beg for the food and the female passes it to one of them. 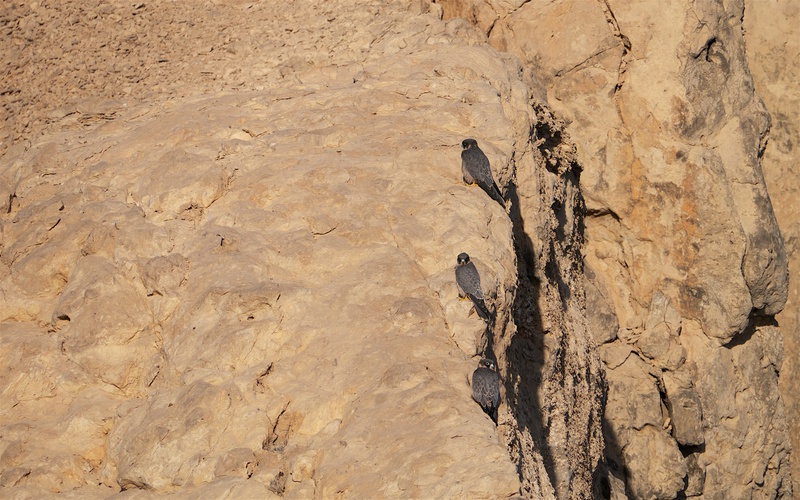 She finished feeding them herself a few weeks ago around the time when they fledged from the bare ledge on the cliff. 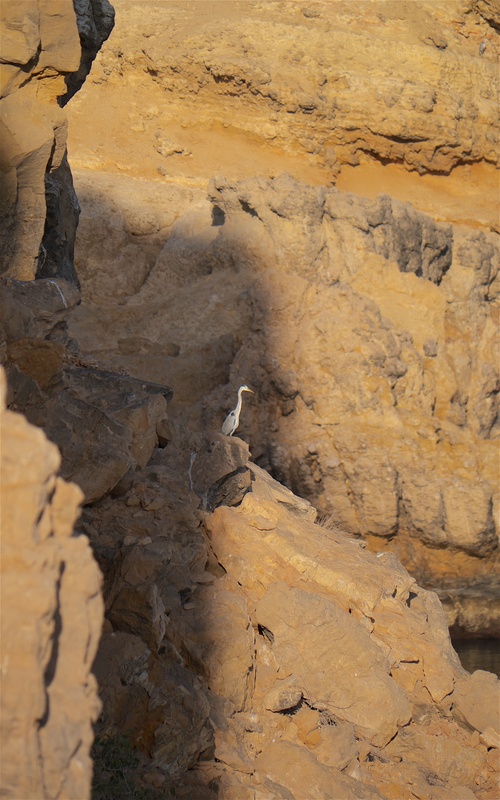 The adults and young sail close to the cliff edge on the up draught. This is one of the young with their tell-tale shorter wings; the primaries are still to grow to their full extent. There are four young with one snatching the big prize and soon after, taking it away to quiet corner to pluck and feed. I am not sure if there is an interloper from the other nesting pair on the island or there are four young in the one brood. One of the young sooty falcons with an imperious air. 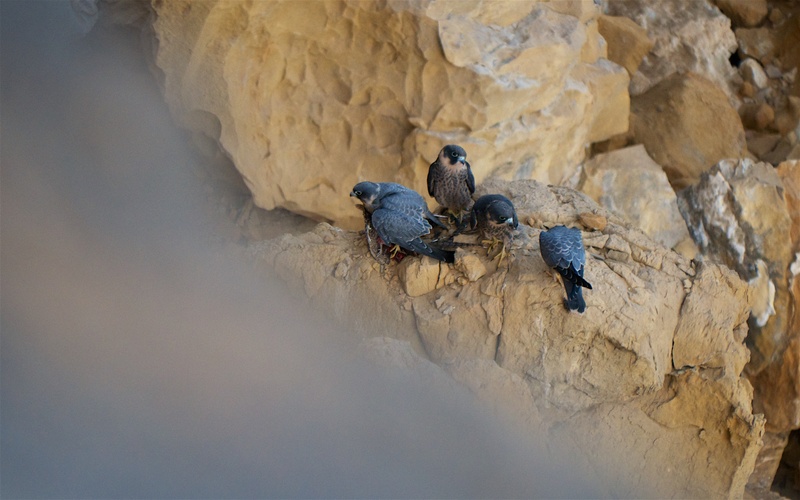 Sooty falcons are closely related to the Eleanora’s falcon, which has an identical breeding ecology but the latter’s distribution is confined to the cliffs found on the myriad islands of the Mediterranean. Both species spend the winter in and around Madagascar. 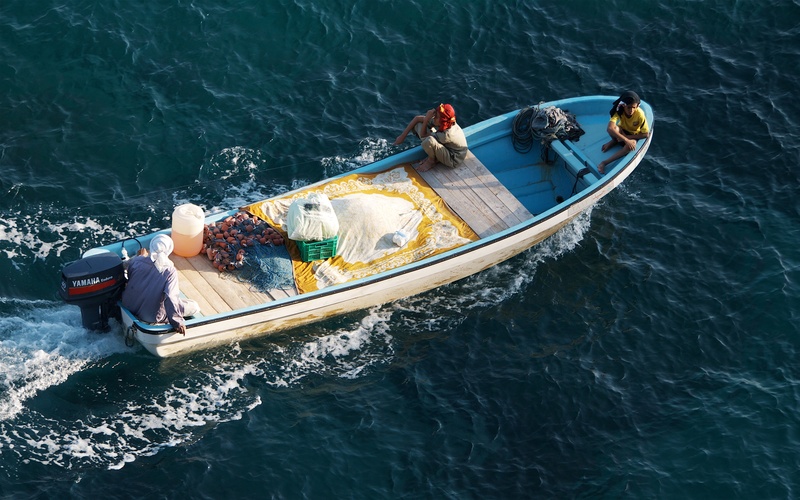 A fishing boat, full of colour, makes its return with its morning’s haul past the the island. 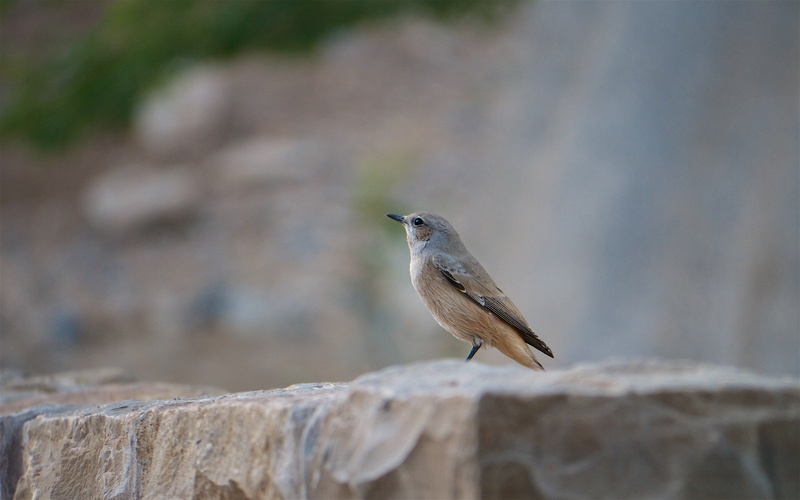 A red-tailed wheatear looks up anxiously. 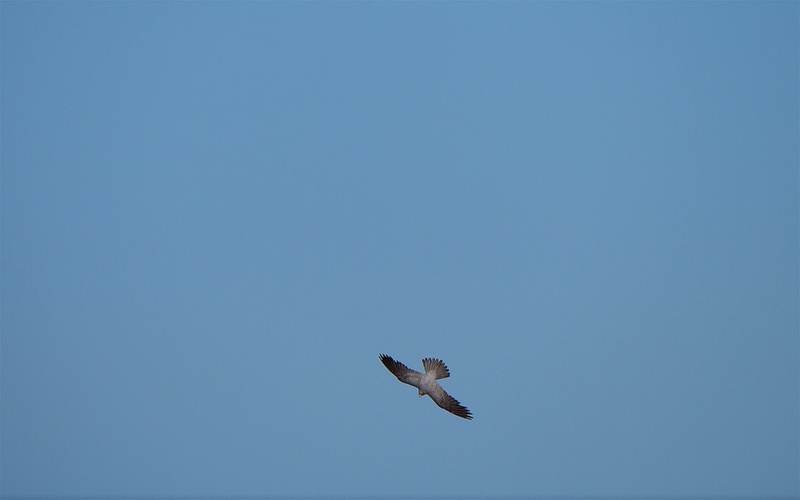 An adult sooty falcon stooping in the empty sky. As the sun warms the day, the temperatures rise and I retreat to the beach. The fishermen never return and, after an hour or waving, paddling in the clear water and watching ospreys hunt the shallows, I manage to attract the attention of people on the beach across the straits. Soon an old man in an old skiff comes across to retrieve me from my private island.